Students can choose from over 70+ majors, 50+ minors, and a variety of preprofessional options, as well as joint majors and combined bachelor's/master's degrees. The student-to-faculty ratio is 8:1, the average class size is 22 students, and 82% of classes have fewer than 30 students. 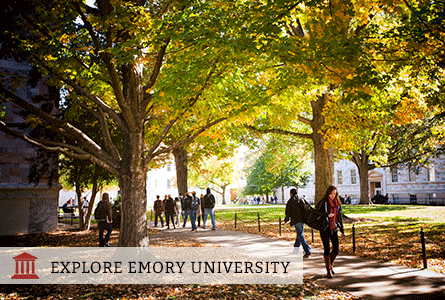 The First Year at Emory (FYE) program offers students the chance to get to know the campus, professors, and fellow hallmates through unique programming on campus and in residence halls. 48% of students pursue research with faculty, and 27% pursue independent research. Research is available across all disciplines, and available even in the first-year. Pre-health and pre-law advising is available for students interested in pursuing either a health profession or a law career. Over 135 programs worldwide are available to study abroad, and they are available for a semester, summer or full-year. 54% of students have at least one internship during their four years. Students can choose from approximately 2,000 internships in and around Atlanta, and 10,000+ beyond.